Spread over an area of 940 km² in the districts of Mandla and Balaghat, Kanha National Park is known as one of the largest national parks in Madhya Pradesh. 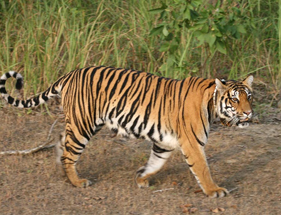 This Tiger Reserve is formed together with a surrounding buffer zone of 1067 km² and the Phen Sanctuary of 110 km² areas. The national park has a large population of Royal Bengal Tigers, Sloth Bears, Leopards, Barasinghas and Indian Wild Dogs. The park has bamboo forests, grassy meadows and lush sal trees, which inspired Rudyard Kipling to write his famous 'Jungle Book' novel. 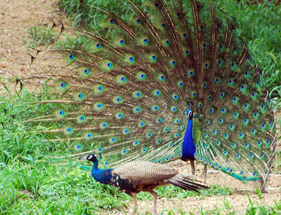 Maikal and Satpura mountain peaks cuddle up this magnificent National Park. The landscapes and the nearby luxurious meadows with wooded strands and the dense maroons of forests provide magnificent sightseeing experiences to wildlife lovers. One of the popular attractions in the park is Bamni Dadar, which is commonly known as Sunset Point and it offers the most striking backdrop of the sunset. Among the deer species, the Swamp Deer is the main attraction of park. Other wildlife attractions of Kanha National Park are the tiger, gaur, bison, chital, black buck, mouse deer, jackal fox, sloth bear, hyena, porcupine, python, jungle cat, pea fowl, monkey, mongoose, and leopard. Visitors would be captivated by the sight of wild animals in their natural habitat. The different species of birds inhabiting the park include storks, pintails, teals, pond herons, peacock, jungle fowl, pea fowl, partridges, spur fowl, quails, spotted parakeets, ring doves, green pigeons, cuckoos, rock pigeons, bee-eater, rollers, warblers, woodpeckers, kingfishers, finches, and fly catchers. The park has a number of flowering plants too including sal (Shorea robusta) and other mixed forest trees, sprawled with meadows. The dense forest zones include abundant species of climbers, shrubs and herbs thriving in the park.